Muniammal has evolved her own version of B2B – Bananas to Business! In Vellore district in Tamil Nadu, where she lives, she has literally gone bananas over banana fibre, churning out artefacts and other products from it. It is a craft and Muniammal is a master craftsman sharing her skills with other women who are making it a livelihood, like her. It all started some years ago when her family was in penury and she was looking for ways and means to bring in the dough to keep her home from disintegrating. At that time she volunteered to undergo training in banana fibre craft in Bangalore. While others ridiculed the prospects, her inner voice told her to go for it. She was the sole member from her village to enrol for the programme. 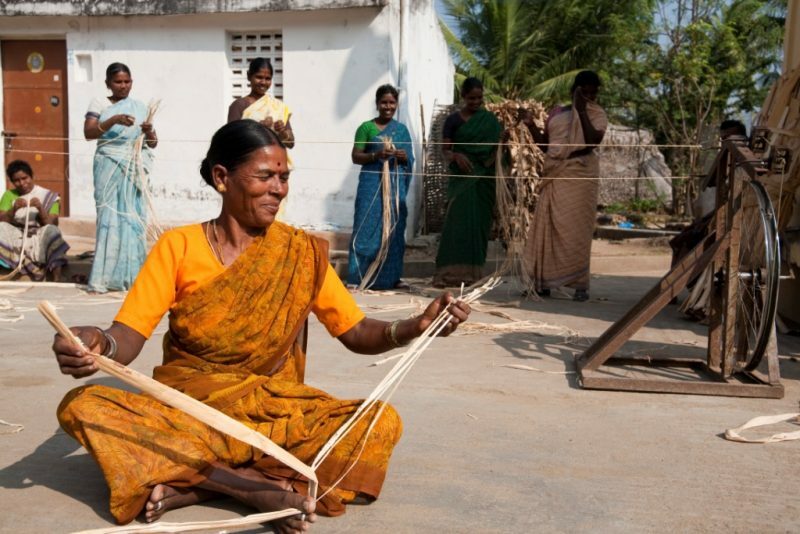 Apart from learning a craft, the banana fibre crafts industry has revolutionised several villages in Vellore district by giving people a livelihood and substantial returns. Now the challenge lies in scaling up the initiative, like looking at exports perhaps. Over 2000 individuals have received training in this craft, including 200 women from 29 hamlets. All of them boast of handsome returns. Meanwhile Muniammal has become a sensation of sorts in Vellore district for virtually revolutionising village life using the ubiquitous banana plant. She was presented the CII Woman Exemplar Award in 2013 for empowering Scheduled Caste Women, in particular, to become the masters of their destiny using low-cost techniques. She was nominated for the award by the Srinivasan Services Trust.